There’s been a barrage of attention on the iPad and it’s hard to go anywhere online and not see a mention of it. I have no doubt the device is fun, incredible, even revolutionary, but after seeing some of the iPad setups out there I am left wondering are people missing the point of the iPad? Look around online and see if something pops out at you too; the amount of people using iPad’s with an external keyboard. These are smart and really tech savvy people, the above picture is from Gizmodo but mirrors a setup used by Steve Rubel, and on the left is what TUAW blogger Erica Sadun somehow calls her iPad + stand + external keyboard setup as ‘ridiculously convenient’ – what’s convenient about carrying around three items that can be handled by one less cumbersome laptop? 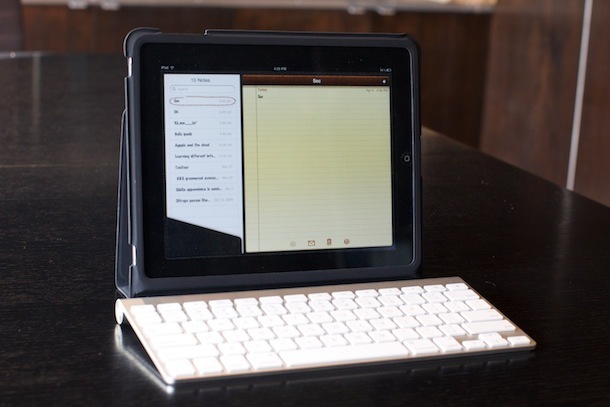 If you’re going to bring a stand and an external keyboard for using the iPad, why not just carry a laptop or netbook? It seems really strange to carry around a detached additional keyboard just so you can use the iPad like the device it’s supposed to replace, a laptop. Typing on a tablet is serviceable but not without strange moments. It’s pretty clear that typing is a secondary function for the iPad. We knew this would get a little bit weird. Apparently, there’s no better way, than to hook up an external keyboard. If typing is a secondary function for the iPad, why on earth is everyone trying to use it as if it’s a laptop replacement? Am I missing something? I admit I’m speaking without firsthand knowledge here, I haven’t even used an iPad yet… but all these pictures make me wonder. So I have to ask, are people missing the point of the next phase in the touch UI revolution that is supposed to be the iPad? Or is the iPad just really hard to type on without an external keyboard? Buying accessories to the iPad should be kept to a minimum or the total concept as I see it is reinventing the mini net-book/Lap top of today. Well you are right and you are wrong, and so are they. The iPad is not supposed to replace the laptop, just augment it for when you’re doing things that it can do better (web, media). Why on earth the people you mention are trying to use their iPad as a laptop replacement is beyond me, and it’s absolutely ridiculous to carry around a bag full of stands, cases, keyboards, and the kitchen sink to try and use a media consumption device as some sort of laptop replacement. What really cracks me up about the smaller picture you posted is that there’s an iPhone next to the overdone ‘convenient’ iPad setup, LOL! I think many are really missing the point, I wonder what Steve Jobs is thinking when he sees pictures like these, and it kind of makes you wonder about the future of the iPad. When the laptop came out were people carrying around external monitors and keyboards so they could try and replace their desktop on the road with it? It’s like a bad comedy really. I think the people trying to use the iPad for work (and by work I mean a not specific work related application, such as bar code scanning, CC entry, etc) are forcing something that was never meant to be. A cheap laptop works better as a blogging platform. A cheap laptop works better as a data entry machine. Why use the iPad for such a thing? I bought the external keyboard. 70-90% of the time my iPad will get used for media consumption. But sometime I see drafting notes, writing longer emails, etc… in the midst of doing those other things. I don’t expect to travel with the keyboard, nor do I expect to do a lot of writing, but enough to justify the modest cost of the keyboard. Yes, some people are missing the point of the iPad, tho maybe not the ones you think. You are assuming that the users above, or their ilk, are actually carrying that equipment with them. It’s just as likely that these photos are their docking setup and that when they’re on the go the accessories stay at home (or the office as the case may be). I totally agree. While using the iPad as a laptop computer with a keyboard is okay sometimes, that is not its primary purpose. It’s more of a media center that you use on the go. I must admit, though, if already had a good laptop computer, I probably would have held off getting the iPad, because it’s not a good laptop replacement, especially for video editing, major photo editing, and even some long-term document creation. I should add, though, that one essential accessory I would recommend getting is the Apple case for the iPad. It’s almost necessity for both protecting the device and using as a stand. Let’s point out that apple’s main apps are the iWork suite. So it’s not completely out of the realm of what Apple expects. Having an ipad, I’m still trying to get a sense for where it fits in my life. The onscreen keyboard is a bit wonky. I’ll still need to use a real computer / laptop for most real work. But what about the very causal user, that basically browses the web, plays games, and enjoys elegant apps for recipes and tv. They almost don’t need a laptop. An external keyboard may just be enough, so that if they sit down, than can bang out a basic document with little frustration. The actual bigger problem is the inability of the iPad to live without a connection to a real computer with iTunes. That’s really too bad, even for those with laptops. I’ve been underwhelmed with my experience so far. But a few apps out there do show the promise. With time, and some limited form of multiasking for instant messaging, I still think this thing is will slowly explode. Are laptop owners who use theirs with an external monitor and keyboard also missing the point? Personally, I think this is a brilliant idea. No, it’s primary purpose is not to replace a laptop, but so what? Does any well designed product not work well in a number of environments and applications, particularly Apple products? I actually wish I could use an external keyboard with my iPhone, like Palm users can. There’s something about hauling around a MacBook Pro with *more* moving parts (like the DVD burner) that makes me… NOT want to haul it out into the field. For that reason I have a netbook with my text editor with an SSD… it seems to be a bit less frail. I have text editors on my iPhone to jot down things and then when I get back to the main site (home, home2, office) then I sync text and images back via ShoveBox or PasteBot.. or just plain email. The same folks who think this way are the same ones who used to use folding keyboards with their Palm Pilots, Newtons, or bought and modified Netbooks to what they wanted to do. A small device and if enough text work is done, an equally small keyboard to get text in faaaast. Now they don’t… if the right Apps are present in the AppStore, and if Apple’s small but functional BT keyboard do the trick. It’s certainly a lot less to haul around than a MacBookPro and AC Adaptor and.. and.. and.. if you’re going to the cafe and not some jobsite. People just replaced their iPads with a 10″ screen that doesn’t even have a keyboard and so they have to bring an external one around. Oh and it’s got less functionality. SORRY people the iPad is NOT a laptop replacement. So far I use mine exclusively for the couch, bed, and trips to the coffee shop, it’s really great for digesting news but I can’t even begin to fathom using this is a primary machine or carting around a keyboard for it. Are people missing the point? YES, it’s NOT a LAPTOP!!! I’m starting to realize the iPad is a Netbook (+ eReader) replacement! I think you’re missing the point that different people use their devices for different things. Totally agree with the article – who on earth wants to “consume media” or even Read on a color XGA screen? And a net-top is a LOT more convenient for those of us who create. 1. At my desk – heavy internet, vpn, work e-mail, calendaring, productivity apps, creative apps, printing, etc. 2. At client sites – note-taking, terminal/shell, internet, spreadsheets, etc. 1. On the go (cabs, while walking, on the train, at the airport, etc) – phone, calendar, contacts, voicemail, light e-mail, voice memos, camera, video, SMS, weather, stocks, calculator, and a few game apps to pass some unexpected time. 2. Bedroom – sleep timer with music, alarm clock to wake, the iPhone gets plugged into a bose soundock that also charges it overnight while I sleep. As you can see, all of these things are fairly distinct uses. I’m glad I have just the thing for each scenario. And I do not expect any one devices to deprecate the other(s). All have their strengths, all have their weaknesses, and the sum is greater than the individual parts. You could have used the iPhone for everything you used the iPad for. Fact: iPad is just a oversized and overpriced iPhone. I disagree that typing on the iPad is that bad. I’m a blogger and I am now using the iPad to write and publish my posts and I do not feel like it is a struggle. Naturally there are some growing pains as you learn to adjust from the physical keyboard to the touch screen keyboard. But we all had to learn how to type at some point. And we all had to learn how to text with a number key pad. And then we all had to re-learn how to text on an iPhone. So yeah, you spend a little time adjusting. But after a few weeks of owning the iPad, I no longer need to look at the keyboard as I type. I’m using it to type out this comment. I love it. Your narrow mindedness is pathetic. You make it sound like they are carrying around 15 bulky items. I mean, You circled 3 things in that photo. They Probably all condense to a small manageable bundle and can fit in a small bag or briefcase. Not to mention the keyboard is NOT a permanent fixture. So unlike the static image you display, the individual has the nifty ability of picking the iPad up and leaving the keyboard and stand behind…. ZOMG, That’s so crazy hey! Yes, people are missing the point of the iPad. I suspect that the author of this article is one of them. I’m not a blogger. I’m a journalist, with real paper and real deadlines and events to cover. I’ve written about and used more kit over the past 20-odd years than most geekblogs remember exist, and mobile computing has always been a passion for me from the Tandy 102 I carried around in school to the FlipStart and netbooks today. The iPad’s battery life, simplicity and ability not to carry the keyboard with you, but to leave it behind if you choose, are key to the success of the platform. Those three items (two, given that everyone and their dog has a case of some sort for their iPad) weigh less than any remotely decent netbook, the system is more robust, faster to use for simple tasks, and can complete a day’s coverage (or more importantly, do some work one day, then when you forgot to charge it still be usable the next day). The iPad is not an oversized phone; phones have become miniature simple computers that for some inexplicable reason people still insist on trying to do serious work on (myself included, having relied on a Nokia E90 for quick coverage for ages); partly due to the phone’s ‘ready’ state – flip it open and start typing. What is apparent is that the iPad is a beautifully simple computer, a Macintosh 128 in a world of Commodore SuperPET MicroMainframe systems being asked to perform basic tasks. It’s the best word processor for the purest form of text creation, it’s the best research tool for sitting in the evening and skimming sites, it’s the best sketching tool for quick, paper-like scribbles. Windows will remain a barrier to netbooks having this simple utility, and JooJoo is still some time away from giving Linux that interface consistency. The iPad is the most natural slate device going; the keyboard simply adds to the utility for people who need the interface rather than adding to the bulk for people who don’t. I still need a laptop. I use a MBP for hard work, for image editing, and I can use Windows tablets for in-the-field camera work, but for reporting, thinking aloud, making notes and sketches – the creative aid to the process of making articles and content – the iPad is the best product I have come across yet. (The iPad with keyboard has let me sit in the living room, iPad on a little IKEA Dave table at roughly eye-height and Apple Wireless Keyboard on my lap at a fraction of the weight and none of the heat from a laptop, and write a 2,000 word review in no time without having to exile myself to the office. The laptop wobbles on the flimsy stand and to have it on my lap for that type of writing is uncomfortable, the netbook’s screen is too small to view at that distance and the keyboard is cramped). The iPad is flexible. Why? Because we all want to use it in different ways. Isn’t that one of the great things about it? I’m on the road a lot, so I appreciate less bulk and weight to have to carry around and when at home, I’ll use it on the couch, but from time to time, I reel of a bunch of emails, and for that I’ll pop it on a stand, sit at the desk and use a Bluetooth keyboard. i don’t think people are missing the point of the ipad at all. shouldn’t we be thinking that people are stretching and being creative about one of the more creative and revolutionary devices of the decade, and are trying to use it in the ways it suits them better? That is exactly where the marketing of Apple wants them to do. it is the way they have to evaluate which road they will take next on the next version/upgrade. if we are producing a new product and we are spreading it like a disease, we should already be thinking into the ways of making it better for the next upgrades, right? I have worked in the IT industry for 23 years now, within companies from small local resellers up to tier1 hardware vendors. During this time I have used or had a chance to experiance almost all of the technologies that have been unleashed upon us mere ‘users’ and i can catagorically say that what IPAD offers is uncomparable to anything on the market. To me the point is thus: I have a usable client device that starts up at the click of a button, no os load time, it lasts for 10 hours, does not burn my lap whilst using it, is small enough to carry easily but.. large enough to be practical, oh and almost forgot, ot has applications that are usefull. As of this date, there is no other device that can offer these features, there will be some in the future, and time will tell for their success… and now the the feature title, no, i do not think people are missing the point, remember the IPOD? the market was awash with MP3 players that were cheaper, arguably easier to use and less proprietry, where are they now ( Zune?).. the deciding factor was that other peripheral vendors got behind the IPOD and starting manufacturing an amazing amount of add-ons and mods for the IPOD, this is the only reason they make sense – versatility, and if people want a keyboard, stand, coffee mug holder, paisley skin (your getting the picture) for their IPAD this will ultimatley make the IPAD’s longevity as a product more assured which is great news for IPAD owners, and as the newer Slate devices get released, they will not get these additonal items, which will ultimatley commit them to the ‘shed of technology that was quite good but failed’! The point of the article is not being anti Ipad. The editor is simply saying why try to turn it into a data entry machine when a netbook or laptop is far more convenient and efficient. However for one – it is more cost effective to buy a bluetooth keyboard than another device – after all you’ve just spent $500+ on an ipad. Nobody wants 3 devices right? It is a brand thing. The set up is like a netbook for Apple enthusiasts not wanting a netbook. Apple doesn’t release a netbook because it will draw sales away from the ipad. My take is different – everybody is getting the point of the ipad. The purpose of this device (coupled with the appstore) is to replace as much of all the other tech/toys/media we own as possible, be it a magazine, newspaper, dvd, tv, word processor, netbook, etc etc…etc. By not targeting a specific market they can get into all markets…and the more company’s that adopt their platform the harder it’ll be to outdo them. Sure my desktop is better for games, iphone is better for communication (well…maybe not, but its great for much the same reasons as the ipad), ipod/zune/whatever for music, archos 7 for watching movies…but some people dont want to own all that, or dont want to carry around all that…or want a primary device, but maybe to doodle with games, documents, books, whatever, wherever they are – who doesnt want to say write down a great idea mid-tube/bus ride? There is a reason why Apple uses the catch phrase “The…is for everyone” – which everyone are you? @JB82: the MB Air is, apparently, Apple’s idea of a netbook. The iPad is something else. It is based around the concept that most people today are using a computer *only* as a means of accessing the interwebs (FB, YT, mail) and running simple apps and perhaps some really basic wordprocessing. They don’t even understand most of the options and menus a full-blown OS offers them. Most of them are also totally incapable of typing, much less *touch* typing. So, why don’t take the keyboard away, simplify the OS and make it web-centered and pack it into a convenient, trendy designer accessory? I think the idea is just great. Personally, I wouldn’t touch an iPad with a stick, because I’m a computer nerd and I, er, didn’t spend the best part of my life typing on a keyboard in the dark just to get myself a touch screen thingy and forget how to type. My uncle has always had some kind of irrational fear of computers, he wouldn’t touch one with a stick, he never did email, never surfed the internet, never learned to type. I gave him an old notebook of mine and it’s been sitting on a cupboard for ages. Then he got himself an iPhone to replace his crappy mobile phone from the Cretacic age and… guess what? He’s LOVING it, he does email, he calls me via Skype, he surfs the interwebs. But sometimes he wish he had something just like his iPhone, but bigger. There you are, proof of the vailidity of the iPad concept. I have used an iPad were it was on display at a mall and I’m here to tell you these people are bitching about nothing. Typing is rediculously easy. I generally use my iPad for reading e-books, Bento (a great database app), email and web browsing. It serves all that I require from a portable device, except for a smartphone (I don’t own one, nor do most anyone else, as far as I can tell). I have a portable keyboard at work, which I leave there. Otherwise, I use the iPad’s virtual keyboard.